Here’s how to remove warts on hands and feet using DYC Apple Cider Vinegar. You should feel a slight tingle but not an intense burning when the Apple Cider Vinegar is applied. If your skin is sensitive you can try diluting with half water half apple cider vinegar (this will extend the time it takes to remove the wart). If your wart has not shown signs of reducing in size after 5 days, please see your Doctor. This method is suitable for warts on hands and feet only. 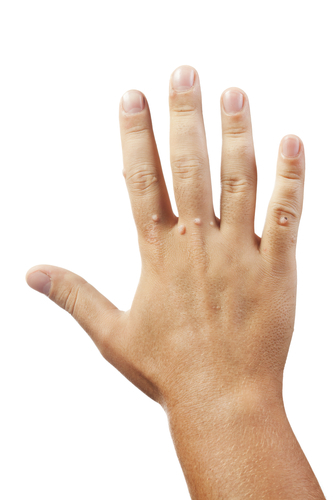 It should not be used to treat other types of warts. Start by filing down the wart with pumice or an emery board. Be careful not to disturb the skin around the wart. Clean the wart and area around the wart with soap and water and dry well. Apply vaseline to the area around the wart. This will protect your skin from the application of Apple Cider vinegar and help stop your wart from spreading. Soak a cotton ball in DYC Apple Cider Vinegar. Place the cotton ball on the wart and hold in place with a band aid. Medical tape and even duct tape can work too. For larger warts use duct tape (as it helps to seal out air). Leave in place overnight - or longer if possible. The longer you leave it the quicker your results will be. If skin irritation occurs discontinue immediately and wash the area with warm water. Follow this process for around 5 days and your wart should turn black and then dry up and peel off.